It's been a big, big month for UFOs in the news, hasn't it? For the past few weeks, UFOs have been grabbing headlines around the world on a pretty regular basis. And I'm not just talking about headlines on "Open Minds," people, I'm talking CNN, USA Today and Fox News. World-wide headlines! It's been fascinating to watch, and even more fascinating to think about what could be causing this massive upswing in UFO reportage... It's also been a bit disheartening to realize that all this mega news coverage has, in the end, only served to perpetuate old myths and misconceptions, and create new feuds among UFO people (because that's what UFO people do best), and make us all look kinda stupid. Way to waste a golden opportunity, UFO people! 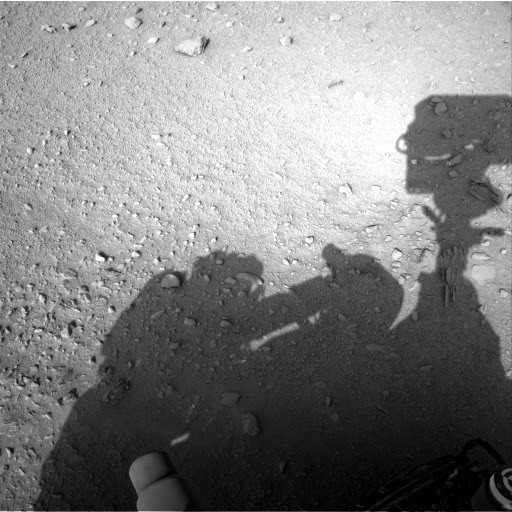 Who is this mystery astronaut on Mars, and what is he/she doing to the rover? Anyway, let's go back to late December, when the CIA publicized a list of the most downloaded documents of 2014 from its website, and revealed that the #1 declassified document of the year was a report of the CIA's top-secret U-2 spy plane program. Okay, not a huge surprise, I guess, but it was interesting that the CIA made a point of emphasizing the UFO angle in this report, not only asserting that mis-identifications of U-2s gave rise to the Air Force's "Project Blue Book" UFO study and that 50% of UFO reports from the late 1950s to the 1960s can be attributed to U-2 sightings. "#1 most read on our #Bestof2014 list: Reports of unusual activity in the skies in the '50s? It was us." Big news item #2 came a couple weeks later when it was revealed that NASA's live video feed from the International Space Station had gone down moments after a UFO was seen in the vicinity of the station. This is huge! It's like an invasion or something! Sadly, no. We have not been invaded, the ISS feed is back up here, and the "object" seen in the vicinity of the station does not seem to have lived up to anyone's expectations. Indeed, it may have been nothing more than a lens flare. Trouble is, noone really knows, because it hasn't returned. Or has it? It turns out, people have been spotting extraterrestrial artifacts in the ISS live feed since just about forever, and then sharing notes with the people who keep spotting jelly donuts and vandalous earth astronauts in photos sent back to earth from the Mars rovers. Big news item #3 came about when it was announced by UFO website The Black Vault that the Air Force's Top Secret Project Blue Book files had finally been released by the government, and that The Black Vault had made all those files available online for the first time. Amazingly, lazy reporters around the world, all of whom should have known better, swallowed the story hook, line and sinker, and ran with it. Within 24 hours it was widely believed that this was a watershed moment in UFO history, that the government had finally come clean about its UFO study, and that intrepid UFO researcher John Greenewald had struck a massive blow for freedom of information and had forced the government to reveal its UFO secrets once and for all. Again, sadly, no. The Blue Book files have been declassified and available online, for free, in a searchable format, for many, many years, which any reporter could have figured out in about three minutes. Now, when the story comes up, awkward qualifiers abound: It's the first time the entire Blue Book files have been made available; It's the first time they've been made available in .pdf document format. So, in summation, if you believe that any publicity is good publicity, then you'd have to be pretty pleased with the abundance of high-profile UFO news hitting the mainstream press over the past month. Good for you! I'll just point out a few of the problems, and you can add your own: among other things, this story has spawned more feuds between UFO researchers, it's given reporters reason to foster new suspicions about why there are no records of the Roswell "UFO crash" among the Blue Book files, and has given credence to the Air Force's claim that "only" 700-some UFO reports out of the thousands and thousands reported remain unexplained. And now that the backtracking and re-explaining has begun, and the news sites have begun adding disclaimers to their stories, UFOlogy looks once again like the realm of idiots, fools and liars. What will the rest of 2015 bring? I could not agree more, Mark!